Lilongwe (Malawi), Jan 7 : Vice President Mohammad Hamid Ansari Thursday arrived in Malawi, a small land-locked country in Africa, - the first Indian leader to visit the country. 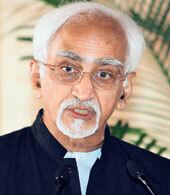 Ansari was received by the Malawian Vice President Joyce Banda at the Kamuzu International Airport. IThe small land locked nation of 13 million people covers an area of 118,488 sq km. The Malawian President Bingu wa Mutharika had obtained a Bachelor of Commerce and Masters in Economics from Delhi University.